On November 25, 2016, about 1145 Pacific standard time, a Bellanca 7GCAA airplane, N88373, was substantially damaged when it impacted terrain while on approach to landing at a private airstrip near Glamis, California. The private pilot sustained fatal injuries, and the passenger sustained serious injuries. The airplane was registered to and operated by the pilot under the provisions of Title 14 Code of Federal Regulations Part 91. Visual meteorological conditions prevailed, and no flight plan was filed for the personal flight. The flight originated from an open desert area near the airstrip about 5 minutes before the accident. A friend of the pilot reported that the pilot had been giving 10- to 15-minute rides to people they were camping with and that he was taking off and landing from a long area of packed sand near their campsite. He further reported that the accident occurred as the pilot was conducting his sixth ride flight of the day with the intention of landing at the private airstrip to park the airplane overnight. The friend stated that during the previous ride flights, the pilot had flown over his intended landing area about 50 ft above ground level (agl) and then continued in a traffic pattern for the landing area about 50 ft agl. He added that the pilot had also flown low in the sand dune bowls in the area during the previous flights. Two witnesses located near the dirt airstrip reported that they observed the airplane touch down about halfway down the runway on a westerly heading while traveling at a high speed. The witnesses said that the airplane's engine powered up, and the airplane pitched upward about 30° before it banked steeply to the right as the pilot executed a 180° turn to parallel the runway. The airplane leveled off at an altitude of about 100 to 150 ft above ground level (agl). Shortly thereafter, the witnesses observed the airplane make a steep right turn toward the runway before it descended out of their line of sight. The witnesses reported that at the time of the accident, the wind was from the east-northeast at 15 to 20 miles per hour. During a telephone interview, the passenger reported that she recalled the pilot conducting a touch-and-go landing and stating that he "didn't like the way that felt" before "pulling out and banking hard to the right." The passenger stated that the last thing she remembered was the airplane "going straight down." 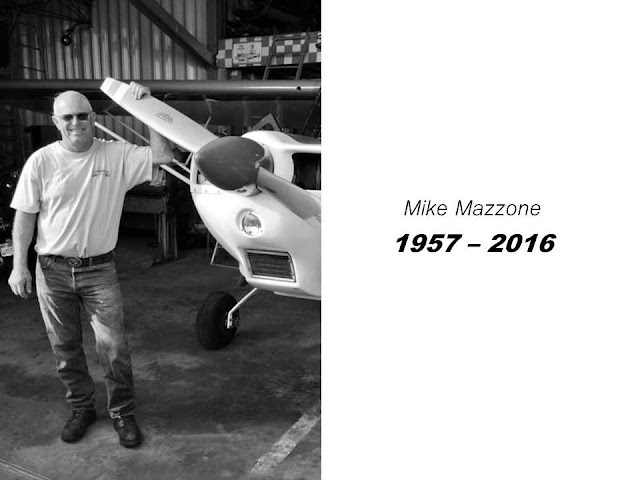 The pilot, age 59, held a private pilot certificate with an airplane single-engine land rating. He held a third-class airman medical certificate issued on September 26, 2016, with the limitation, "must wear corrective lenses for near and distant vision." On the application for this medical certificate, the pilot reported a total flight experience of 430 hours of which 15 hours were in the previous 6 months. Review of the pilot's logbooks revealed that between July 14, 1987, and April 10, 2011, he had logged 265.3 hours of flight experience. Between October 19, 2013, and November 9, 2016, he had logged 178.9 hours. According to his logbooks, the pilot had a total of 442.2 hours of flight experience. The pilot had logged 205.5 hours in the accident make/model airplane of which 8.1 hours and 2.7 hours were in the 90 days and 30 days, respectively, before the accident. The two-seat, tailwheel-equipped airplane, serial number 304-74, was powered by a 150-horsepower Lycoming O-320-A2D engine, serial number L-39348-27A, driving a Sensenich fixed-pitch propeller. The front and rear seats were equipped with shoulder restraints. Review of the airframe and engine logbooks revealed that the most recent annual inspection was completed on May 9, 2016, at an airframe total time and tachometer time of 4,380 hours. The engine was last overhauled on June 21, 1996, at a tachometer time of 1,650.49 hours. At the time of the accident, the airframe had accumulated 17.2 hours since the most recent annual inspection, and the engine had accumulated 2,746.71 hours since major overhaul. The private airstrip was located in an area of open desert terrain. The reported field elevation was 440 ft mean sea level. The dirt runway was oriented about 230°/050° and was about 3,000 ft in length. No flags or windsocks were located near the runway nor was there any weather reporting equipment located at the private airstrip. At 1153, the automated weather observation station at Imperial Airport (IPL), Imperial, California, located about 30 miles west of the accident site, reported wind from 350° at 4 knots, visibility 10 statute miles, clear sky, temperature 23°C, dew point -5°C, and an altimeter setting of 30.10 inches of mercury. Examination of the accident site revealed that the airplane impacted open desert terrain about 565 ft short (northeast) of the approach end of the southwest (230°) runway at the private airstrip. The debris path was about 34 ft in length oriented on a magnetic heading of about 206°. The first identified point of impact (FIPC) was a 1-ft by 2-ft area of disturbed dirt. The propeller, starter ring gear, plexiglass, and a portion of engine cowling were located within a 5-ft by 4-ft area of disturbed dirt about 24 ft from the FIPC. The main wreckage, which included the fuselage and both wings, was located about 34 ft from the FIPC. The fuselage came to rest upright on a magnetic heading of about 009°. Adjacent to the left wing and propeller were portions of the strobe light housing and red navigation light lens from the left wing tip. The left wing was separated from the airframe and displaced forward. The leading edge of the wing was compressed aft to the main spar from about mid-span outboard to the wing tip. The lift struts remained attached to the wing, and the aft strut was bent. The aileron remained attached via all three mounts. The control linkage from the aileron to the bell crank was intact. Both control cables remained attached to the bell crank and extended inboard to the wing root where they were separated. The separated ends of both control cables exhibited splayed signatures that were consistent with tension overload separation. The right wing was separated from the fuselage. The entire wing was buckled throughout, and both wing spars were fractured in multiple locations. The lift struts remained attached to the wing. The forward lift strut was bent with leading edge scratches, and the aft strut was bowed. The wingtip exhibited a 7-inch-wide circular impression on the leading edge that was consistent with an impact with the right main landing gear tire. The right-wing tip lights remained attached to the wing tip. The aileron, which remained attached to the outboard and middle attach points, was buckled upward at mid span. The control linkage from the aileron to the bell crank remained attached. The control cables extended from the bell crank to the wing root where they were separated. The separated ends of both cables exhibited splayed signatures that were consistent with overload separation. The fuselage was intact from the rear door post aft to the empennage. The fuselage structure forward of the rear doorpost was bent and compressed upward with aft compression. The right main landing gear was separated. The left main landing gear remained attached and was bent upward. The airframe fuel strainer screen was free of debris. The front and rear seat lap belts were unbuckled. The forward shoulder restraint was cut. The rear shoulder restraint remained attached to the lap belt buckle. The empennage was intact and undamaged. The left and right elevators remained attached to their respective attach points on the horizontal stabilizers. The rudder remained attached to the vertical stabilizer. Flight control continuity for the ailerons was established from the wing roots to the forward and aft control torque tubes. Rudder control continuity was established from the rudder forward to the rear rudder pedals. Elevator control continuity was established from the elevators forward to the control stick torque tube. The engine remained attached to the fuselage. The vacuum pump, alternator, and carburetor were displaced from their respective mounts. The top spark plugs, rocker arm covers, and both magnetos were removed from the engine. The crankshaft was rotated by hand using a hand tool attached to an accessory mount pad. Thumb compression and suction were obtained on all four cylinders. Continuity was established throughout the engine and valve train. When the magneto drive shafts were rotated, the left and right magnetos produced spark at all ignition terminal posts. The top spark plugs exhibited normal operational signatures; light gray deposits were observed within the electrode areas. The propeller was separated from the crankshaft propeller flange. The spinner assembly was crushed aft around the propeller. One propeller blade exhibited leading edge gouges and was bent and twisted opposite the direction of rotation. In addition, chordwise striations were observed on the forward side of the blade. The other propeller blade appeared relatively straight with chordwise striations and leading-edge gouges. The Imperial County California Coroner, El Centro, California, performed an autopsy of the pilot and determined that the cause of death was multiple traumatic injuries. The heart was enlarged with left ventricular hypertrophy and coronary artery disease with 75% narrowing of the right, 90% narrowing of the left anterior descending, and 25% narrowing of the left circumflex coronary arteries. The autopsy did not find evidence of ischemic heart muscle damage. No other significant natural disease was identified. The Federal Aviation Administration's (FAA's) Bioaeronautical Sciences Research Laboratory, Oklahoma City, Oklahoma, performed toxicological testing on samples from the pilot and identified acetaminophen at 28.86 µg/ml in urine, sertraline in urine and at 0.063 µg/ml in cavity blood, sertraline's metabolite desmethylsertraline in urine and blood, and trazodone in urine and at 0.101 µg/ml in cavity blood. Acetaminophen is a non-sedating pain and fever-reducing medication sold alone or in combination with cough and cold treatments and marketed under many names including Tylenol. Sertraline is a prescription antidepressant with an accepted therapeutic range from 0.010 to 0.200 ug/ml. While sertraline is not specifically known to directly cause impairment, the underlying depression that it is prescribed to treat is associated with significant cognitive degradation, particularly in executive functioning. As a result, the FAA has a specific process to certify pilots with depression who require antidepressant treatment. The FAA's Guide for Aviation Medical Examiners states that "the use of a psychotropic drug is disqualifying for aeromedical certification purposes – this includes all antidepressant drugs, including selective serotonin reuptake inhibitors (SSRIs). However, the FAA has determined that airmen requesting first, second, or third-class medical certificates while being treated with one of four specific SSRIs may be considered." Sertraline is one of these four specific SSRIs. Trazodone is a prescription antidepressant that is significantly sedating; it is often used as a sleep aid. The accepted therapeutic range is from 0.5 to 3.0 ug/ml. It carries the precaution: "Antidepressants may impair the mental and/or physical ability required for the performance of potentially hazardous tasks, such as operating an automobile or machinery; the patient should be cautioned accordingly. Trazodone hydrochloride may enhance the response to alcohol, barbiturates, and other [central nervous system] CNS depressants." Review of the pilot's personal medical records revealed that his medical conditions included colon cancer that was successfully treated with surgical removal and radiation in 2008, chronic pain resulting from the cancer therapy treated with oxycodone until June 2016, and depression and anxiety treated with a number of different psychotropic medications. In a note dated November 2, 2016, the pilot's psychiatrist stated that the pilot had a 5-year history of anxiety and depression and had been treated with sertraline for the preceding 2 years. The psychiatrist wrote that the pilot "recently tried to decrease sertraline from 50 to 25 mg/day and had increased irritability and anxiety and increased dose back to 50 mg/day after 4 days with improvement in symptoms. Reports residual symptoms of marked frustration when things aren't going well [once a week] and [is] always feeling rushed or 'in a hurry' and anhedonia (not enjoying flying and other activities as much as he used to) …Sleeping well with trazodone." The psychiatrist's mental status examination found that the pilot did not express ideations of harm to himself or others. However, the patient's mood was anxious and depressed with a Beck depression inventory score of 18 (consistent with mild or borderline clinical depression). The psychiatrist's diagnostic impression was major depressive disorder (moderate severity). He prescribed sertraline 75 mg daily, hydroxyzine 50 mg as needed for anxiety, and trazodone 100 to 200 mg at bedtime for sleep. Hydroxyzine is a prescription sedating antihistamine for treatment of anxiety and itching. A handheld GPS that was located within the wreckage was shipped to the NTSB Vehicle Recorder Laboratory for further examination. The GPS data that were downloaded from the unit did not contain any information regarding the accident flight. 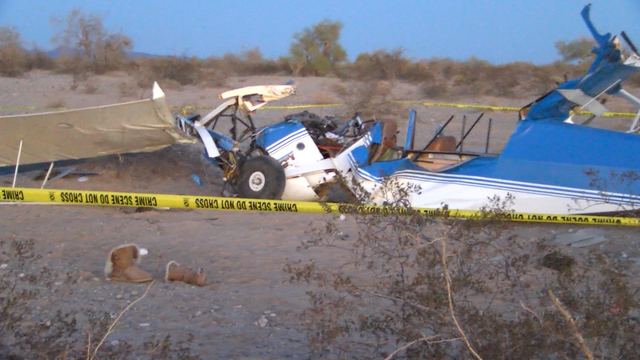 On November 25, 2016 about 1145 Pacific standard time, a Bellanca 7GCAA, N88373, was substantially damaged when it impacted terrain following a loss of control while on approach to landing at a private airstrip near Glamis, California. The private pilot sustained fatal injuries and his passenger sustained serious injuries. The airplane was registered to and operated by the pilot under the provisions of Title 14 Code of Federal Regulations Part 91. Visual meteorological conditions prevailed and no flight plan was filed for the personal flight. The flight originated from an open desert landing area about 5 minutes prior to the accident. Witnesses located adjacent to the accident site reported that they observed the accident airplane land about midfield to the southwest while traveling at a high speed. The witnesses said that the airplane powered up and it pitched upward about 30 degrees before it banked steeply to the right. The witnesses continued to watch the airplane as it executed a 180-degree turn, paralleling the runway, and leveling off at an altitude of about 100 to 150 feet above ground level (agl). Shortly after, the airplane was observed making a steep right turn towards the runway before it descended out of their line of sight. Witnesses further added that at the time of the accident, the wind was from the north-northeast at 15 to 20 miles per hour, and later calmed down within an hour following the accident. A friend of the pilot reported that the pilot was giving 10 to 15 minute rides to people in their campsite, and was initially taking off and landing on a long area of packed sand nearby. The friend of the pilot further stated that the pilot was conducting his 6th ride with the intention of landing at the nearby private airstrip in order to park the airplane overnight. Examination of the accident site revealed that the airplane impacted open desert terrain about 565 feet northeast of the approach end of the southwesterly oriented dirt runway. The debris path was about 34 feet in length oriented on a heading of about 206 degrees magnetic. All major components of the airplane were located within the wreckage debris path. Everyone needs to beware "free" flights with recreational pilots. So much is dependent on the good judgement and scrupulousness of the individual who, despite all the regulations has no real oversight. Lucky the passengers survived that day, although one was severely injured. The individual exhibited numerous oversights and general sloppiness ranging from low currency to risky low altitude flying and disregard of regulations governing medication and chronic health conditions. There's no easy way for his camping companions to know about these issues, and it could seem insulting to query the guy who's doing you a great "favor" by taking you up in his pretty little plane on a beautiful day. Those folks usually radiate competence and confidence. But unless you know that individual's flight history, tell your family and friends "just say no."